Steve Jobs recently posted an open letter explaining why he believes that Adobe Flash is not a good fit for the iPhone, iPod and iPad. Over 1000 words long…what did he actually say? Steve Jobs cites six major reasons why he’d prefer to avoid Adobe Flash on Apple devices. 2. Alternatives for Web Video are available – Most videos on the web can be viewed on Apple devices without requiring Flash. Contrary to Apple’s claims, you do not need Adobe Flash to enjoy the ‘full web’ experience. H.264 is an ultra-modern video protocol which offers a great alternative to playing videos using Adobe Flash. 3. Poor Security – Flash makes Macs crash and it has a notorious history for security loopholes. Till date, there’s no mobile device which shows Flash performing well without any security issues. 4. Kills Battery Life – Flash is a performance hogger and a major reason for drained battery life. An iPhone running H.264 offers nearly double the battery life of an iPhone running on Flash. 5. Poor Touch Capabilities – Flash just doesn’t work well for touch interfaces. It relies heavily on a rollover concept where the position of a mouse cursor triggers certain actions. That’s hardly the best approach (in fact, it’s the worst approach) for a touch interface. 6. Avoid dependency on Third Party Tools – If developers grow dependent on third party development libraries and tools, they can only take advantage of platform enhancements if and when the third party chooses to adopt the new features. It basically means that Adobe’s cross-platform tools lead to mediocre and sub-standards apps. While Adobe has reacted strongly to the above six arguments from Apple’s top boss, it has done little to elaborate its stand on the matter so far. IT departments use techniques like encryption and remote wiping to protect data stored on laptops. While these methods may prevent the data from being compromised, they don’t help locate the actual machine. A free program called Prey might. 1. 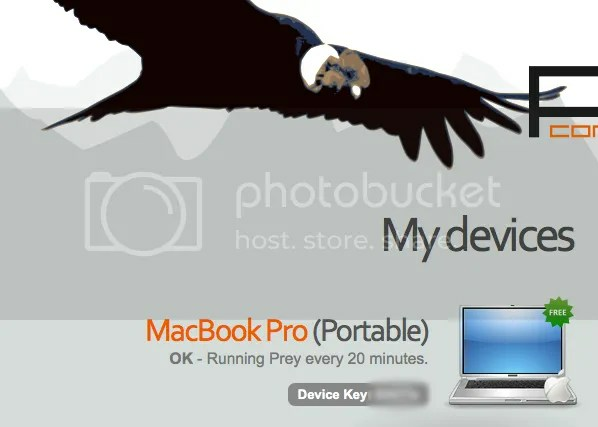 If Prey is configured to use Prey’s online control panel, you simply log in and indicate that your machine is stolen. Prey checks in online from your computer and gets a message that your system has been compromised. If you have gone for the stand alone option, the report is mailed to an email address that you entered when setting up Prey. If you are concerned that Prey might not be able to do what you want, there are alternatives: Absolute Software offers services for Home, Business and Corporate users at a cost. In fact Dell and HP are known to use Absolute Software’s Computrace! Check out the website here. So if you do need to protect highly sensitive data, use a more robust, paid solution like Computrace and always ensure your data is encrypted. Check out the Prey Tutorial over on TechRepublic. I must have tried at least 10 different iPhone apps that were related to getting my files on to my iPhone. The only options I really had were using Dropbox (which required an internet connection), using Google Docs (which required an internet connection) or emailing the files to myself and opening them on the iPhone (which required an internet connection) – can you see where I’m going here! On my iPod 80gig (5th Generation) I was able to use the “enable disk use” option and could pretty much store what ever I wished – in fact I used it as a PDA syncing the calendar, notes, etc. Obviously this is all done with iTunes on the iPhone but I was unable to cross that hurdle of getting anything other than a word/pages/pdf file on to my iPhone without the use of the internet. iPhone Explorer (works with iPod too) allows you manually manage files on your device, or just use it as a flash drive, without jailbreaking! iPhone Explorer is a tiny application (comes zipped at 2 megabytes) and has an easy drag-and-drop interface that lets you copy to and from your iPhone. You can manually transfer your photos, music or movies from your device back to your computer, or just add files to the iPhone. The only concern is that multiple selection doesn’t work so well so if you need to transfer large amounts of files, you might want to try putting them into a folder to avoid crashes. 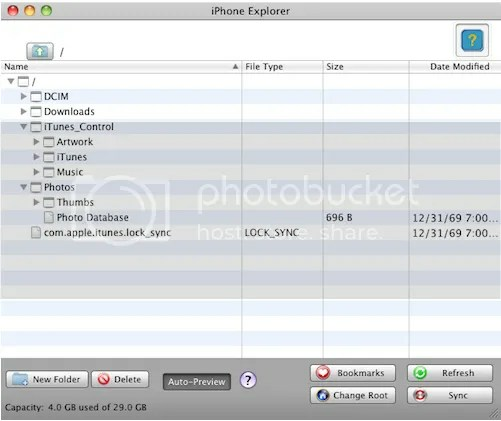 iPhone Explorer is a free download for Windows and Mac OS X 1.5+, requires iTunes 8 or 9 to use. I’ve just got myself a MacBook Pro…awesome piece of technology! Having defected from the Windows camp after about 13 years, I can safely say that I made the right choice. Yes, I will keep the Dell “Windoze” lying around in case of an emergency (although I can’t think of one right now) but my computing heart now belongs to that crunchy Apple! In fact, earlier on I tried to simply email myself a copy of my calendar in Microsoft Outlook so I could import it into iCal and it crashed three times – it was as if XP knew what I wanted the calendar for! For those of you who are debating a Mac (and are sick of “Windoze” and its unstable mind, at least try one out…borrow from a friend – he/she would be delighted to let you use his/her most precious commodity!